ClockWatch Radio Sync allows you to test to see if the program is able to communicate with the WWVB receivers data port through the computers serial port. After the connection to the receiver is opened, the test screen shows the raw data coming from the receiver, displays the information parsed from the raw data, and shows the current readability of the broadcast. 3) the location and orientation of the antenna is correct. Shows the raw data coming from the when the connection to the WWVB receiver is open. Send field: send a command to the WWVB. After connection is made commands can be sent to the WWVB to query for information. Read Delay: To slow down the test screens sampling rate of the WWVB, slide the control to the right. DST: Shows current daylight saving time status in the USA. Displays Std time if DST is not in effect, In effect if DST is currently in effect. Corr: UT1 correction (+/-.1 second increments). Correction (in tenths of a second) from sidereal time. Of interest to astronomers. Status: Current WWV status when connection is open. Status message include OPENING PORT, AWAITING VALIDATION, reading, etc. Readability: Signal readability from 1 to 5 (1 is unreadable, 5 is good). Readability is the best indication of relative signal strength. Points: Number of readability points to show in chart (range of 1-3800). Station: Currently receiving from broadcast from Colorado (CO) or Hawaii transmitters. Shows a map of current readability (1 is unreadable, 5 is excellent). Shows Green when validated, red when validating. Chart box: Shows readability readings. The Setup screen lets you configure the WWVB receiver to work with the Radio Sync software. Model Number: Choose the model number of the WWVB receiver connected to the serial port. Serial Port: Select the number of the serial port (or COM port) connected to the WWVB. Time Request String: Character or string to send to WWV receiver to get time string. Minimum Time change: Enter the number of milliseconds for the smallest time change the clock will be set for. This value should be set slightly above the accuracy of the WWVB receiver. Set the value high enough so that the clock will not be changed constantly by a small value. Initialization Strings: the initialization strings are optional strings that are sent to the WWVB each time ClockWatch starts and before the first time setting is made. The strings can be used to configure the WWVB receiver. Both strings are optional. Handshaking refers to the internal communications protocol implemented in the computer hardware by which data is transferred from the communications port to the WWVB. DSR pulse: Determines whether to have Radio Sync wait for a pulse on the DSR line before making a time fix. DTR Enable: Determines whether to enable the Data Terminal Ready (DTR) line during communications. Handshaking Type: A handshaking protocol is used so data is not lost when it arrives at the communications port. The Radio Options tab in ClockWatch allows the user to set how often the Computers clock is updated from the receiver. It allows you to specify the Refresh time in minutes, the number of minutes between WWVB time readings. When checked it will allow the computer clock to be set ahead but never back in time. Intended to accommodate certain applications that rely on a precise chronological order, such as video monitoring or certain database transactions. It should be noted that the vast majority of computer clocks run slow and not fast, making the exercising of this option infrequent. Use Internet as a backup when WWV is unavailable  connect to an Internet timeserver when WWV is unavailable. Radio Sync will get the time from an backup external timeserver using the settings in the Timeserver tab for which timeserver to use and how to connect to it. Use the warning settings to determine when the backup timeserver should be contacted. Logging allows you to create a permanent record of all time settings made through the WWVB. When selected, the logging of time settings is to the named file. The log shows the results of each reading, regardless if the clock is changed or not. 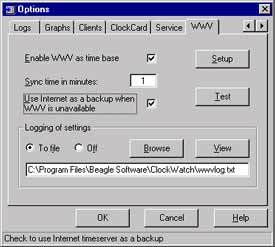 When logging is enabled, the status of each attempt is also shown in the timeserver log window (bottom of 3 windows) on the main ClockWatch screen. The setting log is a record of all setting activity between the WWVB receiver and Radio Sync. Explanation of log file columns and status values. Contact us if your receiver isn't on the list. For more information on Radio Sync, please complete the information request form. Or call us toll-free at 1-877-845-2549.